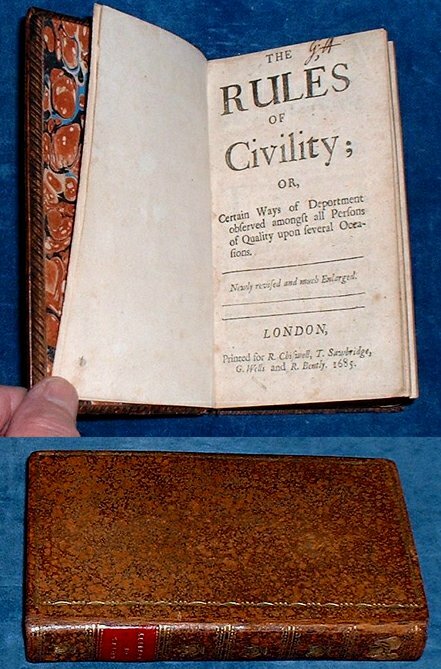 Title: THE RULES OF CIVILITY; or, Certain Ways of Deportment observed amongst all Persons of Quality upon several Occasions. Newly revised and much Enlarged. Description: London, R. Chiswell, T. Sawbridge, G. Wells & R. Bently. 1685 . Duodecimo speckled roan red title label spine decorated with lyre designs between decorated rules & gilt panel to covers (tips rubbed)  + 300pp. Early initials G.A. at top of title, ownership John Haynes 1692 crossed out in margin of Contents, a few marginal worm holes, mainly to sign.C but none touching the print. *Original edition was Nouveau traite´ de la civilite´ (Paris 1671) by Antoine de Courtin. Neat handsome copy of an early well arranged translation from the French to include everything from eating to letter writing, from dancing to conversation, about neatness and all behaviour towards speriors and inferiors (referenced ESTC R14935).